Hello! 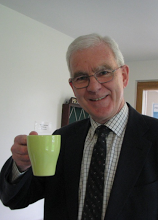 My name is Colin Sedgwick, and for 40 years I have been a Baptist minister. I have also done a fair bit of writing for various papers and periodicals, both Christian and secular. My wife is a teacher and I have two large sons. I hope you might find something interesting in my blog – I aim to provide regular Bible-based thoughts with a short prayer at the end. Perhaps you can use them to “top up” your own Bible-study and sermon-listening.